Dr. Amy Gansemer will kick-off our 2019 speaker line-up with a presentation on introducing a new dog to your home. 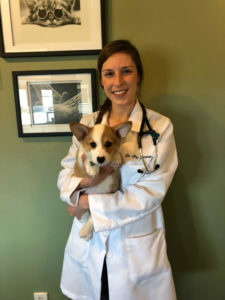 Dr. Amy Gansemer is a 2018 graduate of Iowa State College of Veterinary Medicine originally from Johnston, IA. Dr. Gansemer has a special interest in fear free handling, feline medicine, and emergency medicine. She has four animals of her own – two cats, a rabbit, and a tortoise. Outside of veterinary medicine her hobbies include hiking, fostering animals, and spending time outdoors.